It's Wednesday and time for a brand new Scrapy Land Challenge. The theme is always anything goes as long as you use at least one brand of die that Scrapy Land sells and there are two winners for each challenge. You can visit the Scrapy Land Challenge blog for all the details. 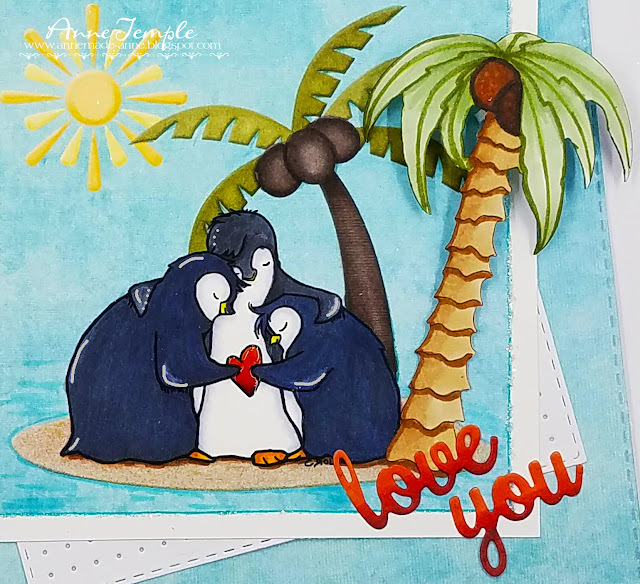 The digi elements used were Tiddly Inks: Be Cool and Love Each Other Penguins and several Kathy Winters Designs (blue digi papers, sun, background palm tree, sandy island) that I've had for years. To start out, I created the beach scene using all the digi elements using Word. You can layer the elements and as long as your focal point is a .png (transparent background) and not a .jpeg (white background), you're good to go. After printing out my scene, I colored the penguins Copic markers. I also colored my sentiment (Frantic Stamper) with Copics and gave the letters an ombre effect. All the layers were die cut using the Sue Wilson peg board die set. I love how one of the dies actually cuts out all those little holes as well as the stitching around each layer. I cut the front palm tree from white cardstock and then colored it with Copics. There is also a stamp set that coordinates with this die, but I didn't use it. I just free handed the details on the palm tree. Now it's your turn to play along with the latest Scrapy Land Challenge. 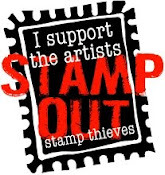 You have until Feb 17 and it can be anything from CAS to altered art, mixed media, scrapbooking, you name it. Just be sure to use at least one brand of die that Scrapy Land sells. We can't wait to see what you create! 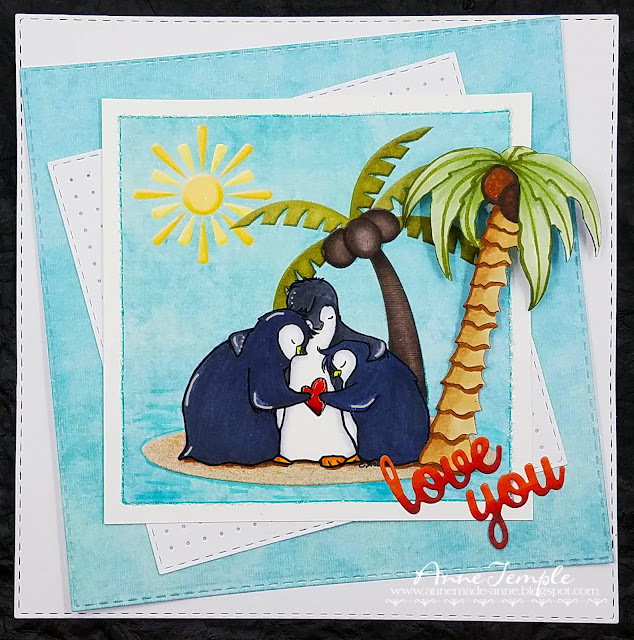 What a fun scene you've created here Anne! Those penguins are adorable! 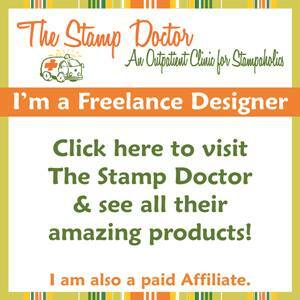 I love all the offset layers on your fun card!! Love, love the beach scene. I went all the way to the Faulkner Islands and Antarctica to see the Penguins. They are awesome. This is beautifully crafted with fabulous composition. What a fun card, Anne. It's not often you see penguins in a tropical setting, but you made it possible :-) Love it!